My first attempt at beading was the peyote stitch and it didn't go very well. 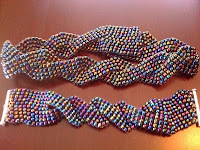 The beads kept shifting to one side or the other. I could have abandoned the attempt, but I'm one that sincerely believes in making lemonade when handed lemons. As a result, this is what my very first piece, and then the matching choker look like! I have more beaders ask me for the pattern to this than anything I've done. Of course there really isn't one since this was a mistake that I turned into something interesting. I had a really hard time coming up with the clasp for the choker because I made it too long. I ended up using Velcro if you can believe that! Unconventional, but it fits the bill just fine.